Dwyane Wade has become one of the NBA's finest "actors." The above is an actual definition that has suddenly become much more pertinent to the world of sports today than I ever dreamed it would. It has taken center stage because of the fact that the very sport where it originated is holding its’ premier event. But flopping has spread to other sports and it’s absolutely out of control. One of the bigger issues of flopping is the discussion over whether or not it is an acceptable part of the game. There are those that define it as doing whatever it takes to win and if getting an official to blow the whistle on your opponent takes some acting then by all means do it. The other side is the more traditional side I suppose. Where is the honor? Where is the professionalism? Is this any way to play the game? I honestly can see and understand the arguments from both sides but in my own personal opinion flopping has to stop. It has made its’ way into almost every sport we watch now and has gone from being a fairly unique circumstance to seeing it almost routinely. The act of flopping has most of its’ origins in the game of soccer. With games that are typically highly competitive and usually very close in terms of score, players will do anything and everything in an effort to gain an advantage. Flopping has gone from a simple act of falling down or reacting as is if hit to a full-blown Oscar-worthy performance that would make Tom Hanks jealous. This flop may have cost Croatia a shot at upsetting Brazil. Brazil was attacking in the Croatian end when a Brazilian player offered up his finest acting performance which drew a penalty resulting in a penalty shot which gave Brazil the 2-1 lead. 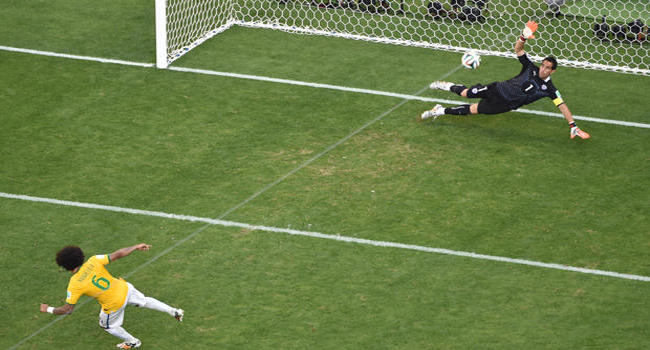 It was a horrendous call and the kind of thing soccer is getting a bad rap for as Brazil went on to win 3-1. Flopping has also become quite prevalent in the National Basketball Association as well. 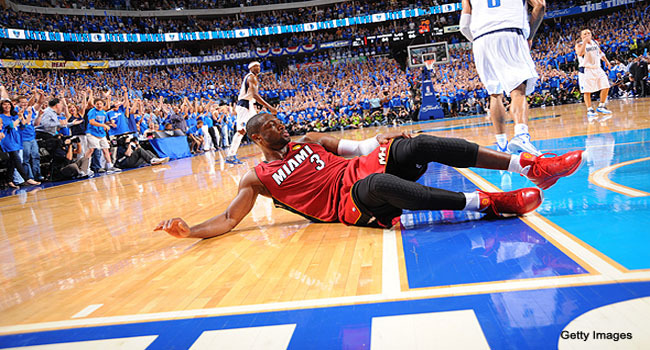 Miami’s Dwyane Wade was fined $5,000 for his top notch acting job in drawing a foul on Manu Ginobili. The sad part about what is happening in the NBA is that some of the game’s biggest stars are becoming the game’s biggest floppers. Players like LeBron James and Blake Griffin have become notorious for their acting jobs. I can’t say they started the process because Bill Laimbeer was once a tremendous actor as well twenty-some years ago but today’s stars are perfecting it. The National Hockey League has seen its’ share of flopping as well but it comes with a different set of rules. If you flop, there will be retaliation in almost each and every circumstance so that does limit it a bit but flopping still happens and the acting is pretty good if I may say so. Even the National Football League sees flopping. Where you may ask? Ever seen a punter put on a Tony Award worthy performance as a defender comes within an arm’s reach? Ya, it happens there too. 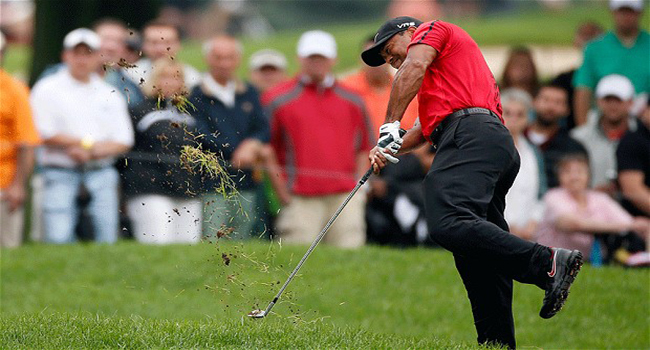 Ultimately, the penalty for flopping must be enough to deter the action and so far it has not reached that level. As in the case with yesterday’s World Cup opener, flopping is affecting the game and sadly, it is affecting the outcome of games as well. 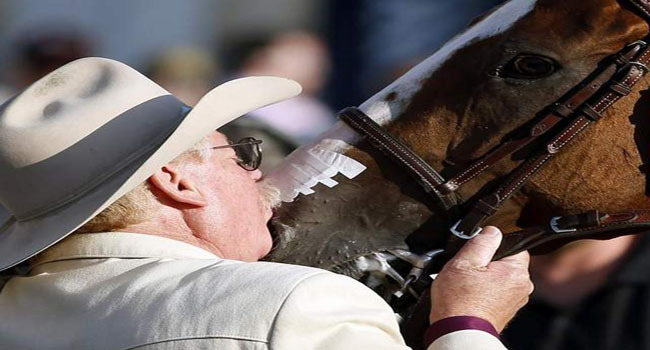 California Chrome Co-Owner Steve Coburn's rant wasn't sportsmanlike, but he was absolutely right. What Coburn was referring to was the fact that Tonalist did not race in either the Kentucky or the Preakness Stakes. Therefore he was clearly the fresher horse. While I agree that Coburn’s rant immediately following his horse’s loss made him look like a sore loser, I also believe he is 100% correct. California Chrome in recent weeks has been dubbed ‘America’s horse’ in large part due to the fact he was purchased for just $10,000. This is considered chump change in the high stakes word of horse racing. Also part of the aura around the horse was the fact that his owners seemed to be ‘salt of the Earth’ people which appealed to the common folk among us. It’s in that vein that I understand Coburn’s passion and emotion. Could he have chosen a better venue and a more reserved style in airing his thoughts? Absolutely he could have, but then he wouldn’t have been himself and that was part of the appeal of who he is. His point is true though. Horses who run the first two legs of the Triple Crown are at a decided disadvantage when compared to horses who run only one or none of them. People not familiar with horse racing often struggle to understand just how massive of a toll these races take on the individual horses. They are not like human beings who can recover after a few days. They need substantially more time. Coburn’s point has not only scientific evidence behind it but also solid pieces of true sportsmanship as well. Despite the way things came off, I hope the people who run the sport strongly consider what Coburn is saying. The Rangers are down 0-2 but Henrik Lundqvist is the one guy who can bring them back. You’d be extremely hard-pressed to find to opening games of any Stanley Cup Final as exciting as these two have been. In the opener, the Los Angeles Kings won 3-2 after falling behind 2-0 in the first period. As they climbed back into the game, the Kings peppered the Rangers’ Henrik Lundqvist repeatedly through the third period before they finally solved Lundqvist late in the final period. In game two, the Rangers jumped to a 2-0 lead again and would actually have leads of 3-1 and 4-2 before finally dropping the contest in the second overtime period. Entering this series I picked LA to win in six games. I felt their offensive firepower and a better than average Jonathan Quick would be enough to beat the Rangers despite Lundqvist being a notch above Quick. In reality, the series has been much closer than even I anticipated and I don’t think this series is over by a stretch. I think the overwhelming athleticism by the Kings has been the difference but the Rangers have countered with speedsters Carl Hagelin and Mats Zuccarello creating great opportunities. If the Rangers can even things up in Madison Square Garden then I think it’s an absolute toss-up heading back to LA. The major difference between hockey and all other sports is the goalie position. While Lundqvist cannot win this series on his own, he can make enough of a difference to keep his Rangers in it. I still feel like the Kings will take home the Cup but look no further than 2011 when Boston was down 0-2 to Vancouver before they came back to win it. 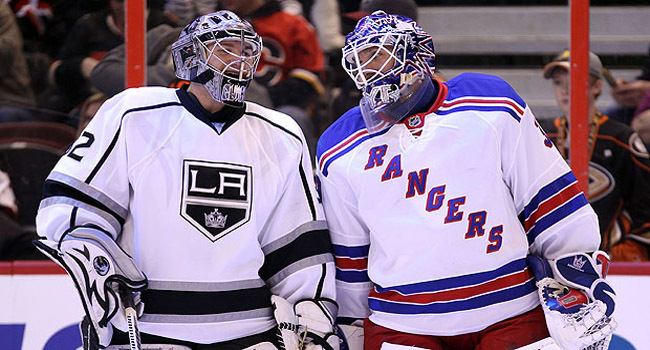 Jonathan Quick and Henrik Lundqvist could provide us a fantastic goalie duel in the Stanley Cup Finals. If you call yourself a hockey fan then you darn well had better have been watching game seven of the Western Conference Finals Sunday night. Both the Los Angeles Kings and Chicago Blackhawks left every ounce of what they had in the tank on the ice before the Kings prevailed in overtime. It was great hockey that featured great saves, great passing and intense action. The National Basketball Association didn’t need a game seven to establish its’ final between two-time defending champion Miami and the Western Conference Champion San Antonio Spurs. Both teams disposed of their opponents in six games and now face each other in NBA Finals for the second straight year. This hasn’t happened since the Bulls-Jazz match-ups in the 1990’s. Both the Stanley Cup Finals and the NBA Finals could offer you some interesting opportunities to make some money. In the NHL, you’ll need to determine whether the LA Kings are tired or whether they will ride a wave of energy and enthusiasm in the early going of the Cup Finals. The New York Rangers have had plenty of rest and normally I’d side with the Rangers in the first two games of the series but let’s consider what I think is a very key piece to this potential dilemma. If the Kings were heading straight to New York to play the Rangers in games one and two in Madison Square Garden, I would give more credence to them being worn down by the series with the Blackhawks but I think this case is a bit different. LA gets to return home for the first two games and the Rangers have to travel across the continent to play the Kings. Despite playing all 21 possible games in these Stanley Cup Playoffs, I think being at home will be a big boost for the Kings. Much like baseball momentum is dictated by tomorrow’s starting pitcher, hockey is often dictated by the men between the pipes and Jonathan Quick and Henrik Lundqvist could have one of the great duels in recent Cup Finals’ history. You’ll need to do some homework on these two but the opportunities are there for you to win in this series. Lay your money on LeBron to lead the Heat in scoring in each game of the Finals. In the NBA, you should have a great chance for success when it comes to prop bets. The series itself will be as tough as ever to make a call on. I’ve already seen many of the top NBA analysts calling this series for the Heat in six or seven or they like the Spurs in six or seven. It’s almost a total 50/50 split among guys on some of the top NBA sites. Much like the NHL, you’ll need to do some serious homework in order to figure the game to game winners but let’s get back to those prop bets. If you like picking the leading scorer of each game then turn your attention to Miami. You can bank on LeBron James leading the Heat in scoring as he does almost every time the Heat take the floor. The Spurs are a different story because of their balance and it could be even more so if Tony Parker can’t go due to the bad ankle. Anyone from Tim Duncan to Manu Ginobili to Danny Green could lead the Spurs so I’d steer clear of the Spurs in that area. Most three-pointers is another area to take a chance because both teams can hit from downtown. I’d lean towards the Heat here because of Ray Allen but don’t for a second forget about the Spurs. Make sure you look over all of the prop bets going off in this series and you can start over at bovada.lv. 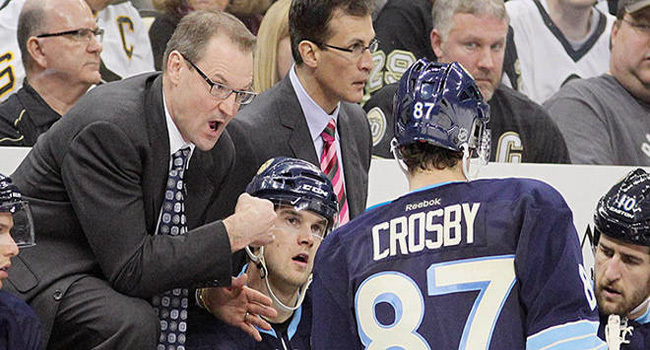 Coach Dan Bylsma and superstar Sidney Crosby are facing a tougher challenge than thought in Columbus. There are always questions heading into any playoff series whether they be in the National Basketball Association or the National Hockey League. These questions usually revolve around four-five or three-six match-ups where the teams are more similar in terms of records. What we’ve discovered already however is that series in both leagues have already taken unexpected turns despite the fact the series are still in the early stages. In the NHL, the second-seeded Pittsburgh Penguins needed a comeback to defeat Columbus in game one and then blew a two-goal lead in game two before eventually losing in overtime. The Pens, who were the best power play team in the NHL this season, struggled in that department going one for eight. They also gave up a shorthanded goal for the second straight game. Star Sidney Crosby had two assists Saturday night but has yet to score a goal as the series shifts to Columbus. Head Coach Dan Bylsma needs a very deep playoff run in order to keep his job and right now that isn’t looking real good. In St. Louis, the Blues took a 2-0 lead over defending champion Chicago by winning yet another overtime thriller. Game one saw the two rivals go three overtime periods before the Blues won. While the Blues entered as the higher seed, they didn’t exactly come in playing well. St. Louis stumbled and bumbled their way to the end of the season and left many wondering if they’d be able to do much in the playoffs. So far so good for them but now the Blackhawks are facing the proposition of having to win four of the next five games if they hope to defend their Stanley Cup Title. Roy Hibbert and the Pacers better get things going or they'll be out before they know it. In the NBA, the top seed in the Eastern Conference has already given up the home court advantage it worked all season to get. The Indiana Pacers looked pretty bad at both ends of the court Saturday dropping game one to the eighth seeded Atlanta Hawks 101-93. Sometimes teams need to get to the playoffs because boredom starts to set in late in the regular season but the problems for the Pacers go beyond being bored. This team has been incredibly out of sync for some time now and we can only wonder just how bad it must be behind the closed doors of the locker room. I believe the Pacers have enough firepower to get through this series but the defensive end is where they’ve made their living and right now I don’t know if they can pull it together. Also in the NBA, both Toronto and the Los Angeles Clippers squandered home court advantage by losing their series’ opening games. In Canada, the Raptors lost to Brooklyn in a bizarre game that featured a ‘human’ shot clock. After the shot clocks at each end malfunctioned, the PA announcer was forced to shout the shot clock at intervals before saying ‘horn’ when it expired. The Raptors will need to get themselves fixed if they plan to head into Brooklyn tied at one. Their playoff inexperience showed down the stretch and they must do a better job at both ends of the court and in time management. In LA, most expected the Clippers’ series with Golden State to be chippy and hard fought but most expect the Clips to prevail. If they are to do so, they need to get it turned around quickly following an opening game loss to the Warriors. For starters, the Clippers need Blake Griffin to foul less. Granted, there were some questionable calls, but Griffin can’t afford to be on the bench having fouled out late in the game. It’s just one game but they need a quick turnaround to even this series. Michael Carter-Williams was a rare bright spot for a Sixers' team that earned just 19 wins. While the playoffs in the National Basketball Association get underway today, one team’s owner is already claiming his team’s 2013-2014 season a success. Yet, his team isn’t even in the playoffs and at one point this season lost 26 straight games. Philadelphia 76ers’ owner Joshua Harris recently said his team’s season was successful and that “all the pieces are in place.” “I think the season has been a huge success for us,” Harris said Friday. While I and I’m sure many Sixers’ fans appreciate his optimistic view, this is a team that won just 19 games this past season. Upon further review however, his wishful thinking may have some proof. The team will have two lottery picks, one via trade, and hopes to have Nerlens Noel at 100%. 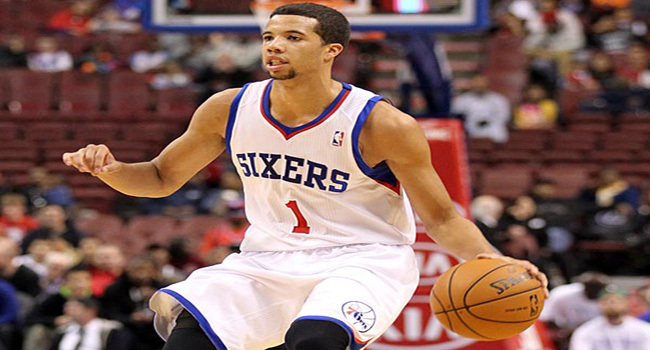 Michael Carter-Williams, despite the poor team record, could win rookie of the year honors. With these two guys and a couple of successful draft choices, who knows? Maybe Harris will be the one with the last laugh but calling this past season a ‘success’ is still a bit of stretch. 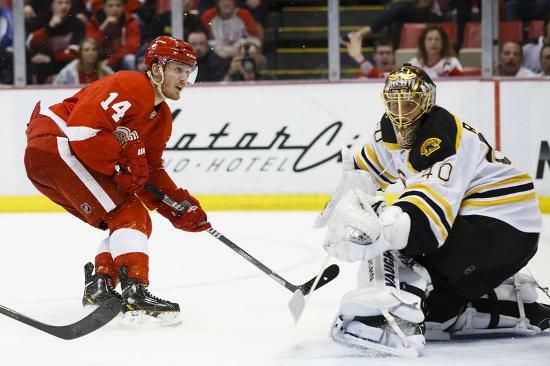 Datsyuk scored the game's only goal in the Wings' defeat of Boston last night. Anyone who knows professional hockey knew that President’s Cup winner Boston was in for a serious seven-game series with Detroit. The Red Wings had beaten the Bruins three out of four times this year and they were getting healthier. Last night in game one, the Wings came out flying and earned a 1-0 victory on a late Pavel Datsyuk goal to take a one game lead in the series. Boston goalie Tuuka Rask was sensational in keeping his team in the game with one great save after another, but Jimmy Howard was up to the task at the other end as well. I had the Wings winning game one but I still like the Bruins to win this series in seven just simply because of experience and overall firepower but a Detroit upset will not surprise me nor anyone else. The Bruins must adjust to the speed if they are to even this series at one. When Will Phil Pull the Trigger? Another NBA team who finished far better than the 76ers did was the New York Knicks. The Knicks and their fans wouldn’t even dare of calling their season a success however. Now that Phil Jackson is aboard as the team’s President with what can only be described as ‘dictatorial powers,’ we should expect some things to start happening in NYC. Most with any knowledge of the Knicks expect some moves to start happening as soon as this coming week. The first move of course will not be to deal with Carmelo Anthony, but will be to send Head Coach Mike Woodson on his way. Probably a cruel fate for a guy who had to deal with all kinds of on and off court situations, but it’s the right move. While no one expects Jackson to return to the sidelines, he will make sure that whoever is in that role will run things as close to how he would do it as possible. Translation: Look for an offer to come Steve Kerr’s way and Kerr has already said that should it come he will accept. As a former guard for Jackson during his time with the Bulls, Kerr knows the famous ‘triangle offense’ and also understands how to handle players both on and off the court. While he will not be mistaken for Jackson himself on the court, Kerr understands exactly what his mentor will expect from him. Once Kerr is in place I would then think that free agent Carmelo Anthony would be next on Jackson’s ‘to-do’ list. The NHL playoffs get underway on Wednesday. The unpredictability of the NHL postseason is quite predictable. Upsets are commonplace in playoff hockey, as fortuitous bounces and hot goalies can change the face of a seven game series quickly. If you do believe that, ask the Los Angeles Kings whom two seasons ago walked in as the No. 8 seed in the West and waltzed away as the Stanley Cup Champions. However, before you go laying large sums of money on the underdog, the favorites also come up big. The Chicago Blackhawks last season set records to open the regular season were No. 1 the entire regular season and eventually won the Stanley Cup. However, according to data taken from Bovada, topbet, betonline and sportsbook.com the difference between the No. 1 seed and the No. 8 seed is blurred on the NHL when the playoffs arrive. Detroit won the season series 3-1-0. 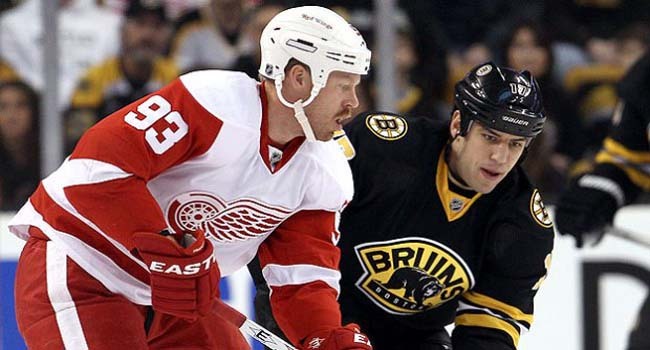 The Bruins might have the league’s best record, but at 1-3-0 against the Red Wings, things could turn dicey. Detroit has injuries to key players and Boston’s Tuukka Rask is considered the best goalie in the NHL. Tampa Bay won the season series 2-1-1. The teams were very close all season finishing just one point apart at the end of the regular season. Three of four head-to-head games went to overtime. The key is if Ben Bishop the Tampa Bay goalie can recover from an upper body injury and be competitive in net. Pittsburgh swept the season head-to-head series 5-0. In five games, the Penguins trailed less than one minute out of 300. Columbus battled hard down the stretch and anything can and sometimes does happen in the postseason. The season series was tied 2-2. The team at home won each game. Philly has defeated New York in three straight at home, while the Rangers have won eight consecutive at home versus the Flyers. Colorado won the season series 4-0-1. Odds makers are not confident with Colorado. They won the Central division but do not have the odds in a matchup of No. 2 vs. No. 7, even though they dominated the Wild this season. St. Louis won the season series 3-2. St. Louis has a much better overall record than Chicago has, but has lost six straight entering this matchup. Chicago beat St. Louis twice in March. The Stars won the season series 2-1. Dallas is a strong underdog and if they can steal home ice in game 1 or 2 could win the series. Los Angeles won the season series 3-1-1. 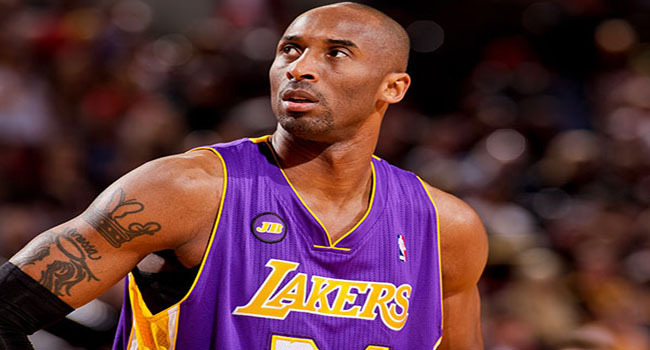 The teams played last season during the postseason with Los Angeles winning in seven games. This will be a tight series from start to finish. I expect a seven game series between these two original eight teams. The greatest playoff run in sports begins this week as the National Hockey League playoffs drop the puck. Yes, you heard me; the greatest playoff run in all of sports is in fact professional hockey. While I can accept that other sports offer dramatic finishes just as hockey does, those sports fail to deliver as often as the men on ice do. What I will not accept is an argument that says “our playoffs are better” because it is simply not true. The National Basketball Association and Major League Baseball give us dramatic five and seven game series’ but how often do their seventh games live up to the excitement of a game seven in the NHL? Not very often and that’s a fact. Here are my predictions for the first round of the 2014 National Hockey League Playoffs. 1 Boston vs 4 Detroit – The Wings took three of four from the Bruins this season and I don’t believe that’s just a fluke. Sometimes teams just match-up better with others. Look for Detroit to take the Bruins the distance but Boston wins in seven. 2 Tampa Bay vs 3 Montreal – The Lightning are 3-1 against the Habs this season but all four games were close. TB faces the 4th best penalty kill in the league and that’s the hurdle they need to get over. Take the Lightning in six. The Pens will go only as far as Marc Andre-Fleury can take them. 1 Pittsburgh vs 4 Columbus – The Penguins won all five meetings with Columbus this season and may have as many fans in Ohio as they will at home. The league’s top power play should wrap this up in five games. 2 NY Rangers vs 3 Philadelphia Flyers – These two split their season series at two games apiece. The Rangers feature top five squads in both the power play and penalty kill. The Flyers aren’t too bad in either of those departments either though ranking seventh in both. I like the Rangers in seven. 1 Anaheim vs 4 Dallas – Despite having a low-ranking power play (22nd) the Ducks still led the NHL in scoring. Their penalty kill is middle of the road which shouldn’t hurt them against a Stars’ team that ranks 23rd on the power play. Take the Ducks in five. 2 San Jose vs 3 LA Kings – The Sharks lost three of five this year against the Kings in games that were each a little different in terms of scoring affairs vs defensive battles. LA ranks number one in the NHL in goals against with just 2 goals per game. Defense wins in the NHL Playoffs and that’s why I like them in six games. 1 Colorado vs 4 Minnesota – The Avs were 4-1 against the Wild this season and averaged four goals per game in those contests. This series will be decided by the special teams’ units because Colorado is fifth in the NHL on the power play while the Wild are 27th in penalty killing. Take the Avs in five. 2 St. Louis vs 3 Chicago – The Blues rank in the top eight in goals against (3rd), goals per game (6th), PP (8th) and PK (2nd). The Blackhawks have beaten the Blues in their last two meetings after losing three straight against them earlier in the season. Chicago has no problem scoring and I think that’s why they take the slumping Blues to seven games and pull the upset.